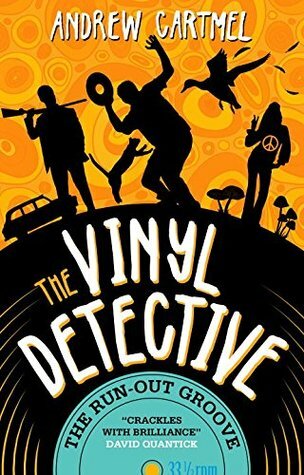 The Vinyl Detective’s latest adventure is a quick-moving read with lots of eccentric characters. This is the 208th in my series of Forgotten Books. Last year, when I was in the process of moving I spent several months living by myself in a college dorm that was closed for the summer, except for me. My television did not work and Sandi was away in San Antonio, so I did a lot of reading. Among the books I read was the first volume of the Vinyl Detective, called Written in Hot Wax. The novel is a fast-moving, first-person account of a man with his obsessions, odd friends and the ability to find the things people want. The unnamed detective lives in the UK and has remarkable luck finding rare records for people. In Hot Wax, he was looking for a rare blues record for a large fee. He found the record, murder and a girlfriend in the process. This time out, he is looking into a rock record, All the Cats Love Valerian. The record was the final release for legendary rock star Valerian who committed suicide when it was released some 30 years earlier. The Vinyl Detective is contacted by Valerian’s brother, known as the Colonel, like his father, to find what happened to Valerian’s young son, who vanished shortly after her death. Her sister Cecilia died not long thereafter. Valerian, the stage name of Valerie Anne Drummond, was a revered figure in British rock, and the detective is not really sure he wants to look into the case. But the Colonel has a clue. Supposedly, a single from the album was set to be released and was pulled at the time of her suicide. Additionally, there may be a hidden message in the record. Both the album and the single are impossibly hard to find. But the Colonel seems to have money and is willing to spend it. The detective and Nevada, his girlfriend, enlist Tinkler (a truly rabid collector with no social skills or filters), Agnes DuBois-Kanes (a taxi driver and friend, generally known as Clean Head) and Stink Stanmer (a less-than-friend but convenient ally who has connections in the record business and is in recovery at a nearby treatment center). They devise a cover story that Stink is bankrolling a documentary on the life of Valerian with Nevada as the producer. They get names and addresses and begin their investigation, but they find the album and the single a little too easily. Then things start to happen around them. There are break-ins, assaults, thefts and “accidents.” Everyone is interested in Valerian but someone certainly does not want them delving deeper into her story. I really liked last year’s book and this year’s too. I love the smell of vinyl and the esoteric knowledge the author imparts through the various conversations the characters have. You can learn a lot about post-WWII jazz from the first book. This one does not get that deep into the rock scene, but there is still a lot of information here. It is also a great fast, easy read; Cartmel has a way with dialogue. The plot and action move fast, even with a lot of deception going on. There’s a grave robbing sequence and an encounter with an attack goose. And an LSD doping and burn-the-house-down bit. The supporting cast is wonderfully bizarre and interesting, including the Shrink who is constantly trying to push his self-published book! Series organizer Patti Abbott hosts more Friday Forgotten Book reviews at her own blog, and posts a complete list of participating blogs.